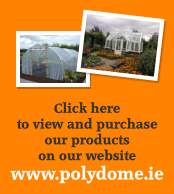 Apologies for not sending pictures of our polytunnel sooner, as promised. Congratulations to Padraig on the birth of his daughter! We’ve had huge success this summer with an enormous number of crops grown successfully in the tunnel, yes I’m going to list them. 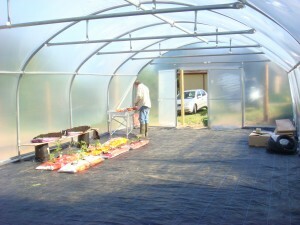 I’m sure new polytunnel buyers would be interesed to know what does well, at least novices such as us. We grew squash, strawberries (from the crop bars), gherkins, courgettes galore, coriander, basil, mixed salad leaves, Cos lettuce, spinach, pak choy, rainbow chard,mangetout, peas, beans 3 varieties, cucumbers, tomatoes 5 varieties, purple carrots, ordinary carrots, green peppers, chillies, rocket, mizuna and more I’ve probably forgotten and nothing was planted until after Bloom – so that has been a tremendously successful start. Of course there is still lots growing & if anyone needs a recipe for using up courgettes I have the most fab cake – a bit like carrot cake but with courgettes. John built 6 raised beds and as you will see from the picture – they really are raised,each is 8ft x 4ft and are a pleasure to work on. The crop bars will be fully utilised next year, with strawberries and tumbling tomatoes and we are going to move things around to put in proper beds for cucumbers and tomatoes, and peppers which we just grew in grow bags this year. We got our soil from Quickcrop 4 tons, and 3 tons of spent mushroom compost, we put up a deer fence (essential here) it was done by Brennan fencing Kilkenny, who like yourselves were professional efficient and did a fast superb job. We’ve had a constant stream of visitors – just stopping for a nosey – so I hope you have got some business out of them as we have sung your praises. Anyway many thanks and here are a few pictures of our patch. company any time! Very professional and good value for money.